When I finish a game, I am very rarely at a loss for words. Almost never, in fact. But Wolfenstein II: The New Colossus is the exception. During my entire playthrough and for a considerable time after, I’ve slowly been making peace with the fact that I don’t think I like this game a whole lot. Or not as much as I want to. And then I’ve spent even more time trying to put that feeling into words. Everything I was hoping for is there, all returning from 2014’s Wolfenstein: The New Order. The gameplay is frantic, there are some truly unforgettable set pieces, and BJ Blazkowicz—who at one time in history was nothing more than a face in the lower third of your Gateway monitor—continues to be one of the best-written characters in video games today. So what doesn’t add up? BJ’s memories are some of the most unnerving moments in the whole game. Wolfenstein II picks up immediately after the events of Wolfenstein: The New Order. To summarize the events of the previous would do it a great disservice, and everyone (absolutely everyone) should play it for themselves, but I’m going to do it anyway. Basically, things are real bad, and BJ and company try to make things less bad and succeed to some extent, but at the end things are still really very bad. America is under an ever-increasing Nazi occupation, and BJ is left to die in an enemy fortress. The New Colossus picks up at that exact moment. After BJ is rescued, he spends five months in a coma aboard a Nazi U-boat that he’d procured previously. While in that coma, he relives some very unsettling memories both from his childhood (spoilers: his childhood wasn’t particularly great) and from the events of The New Order. He wakes just in time to fend off an attack from Frau Engel, who would really like her U-boat back; BJ, in a wheelchair, beats back Engel’s forces and secures the U-boat once more. From start to finish, this opening scenario is absurd. To reiterate, BJ is fresh out of a coma, in a wheelchair, and fighting back a Nazi war party aboard a Nazi U-boat. You might think that the abilities available to you as a player would be somewhat constrained due to BJ’s physical condition, but not so—BJ dual-wields SMGs and performs stealth kills like any other part of the game. And I couldn’t help but smile through the whole segment. Wolfenstein II starts strong with the absurd U-boat sequence. 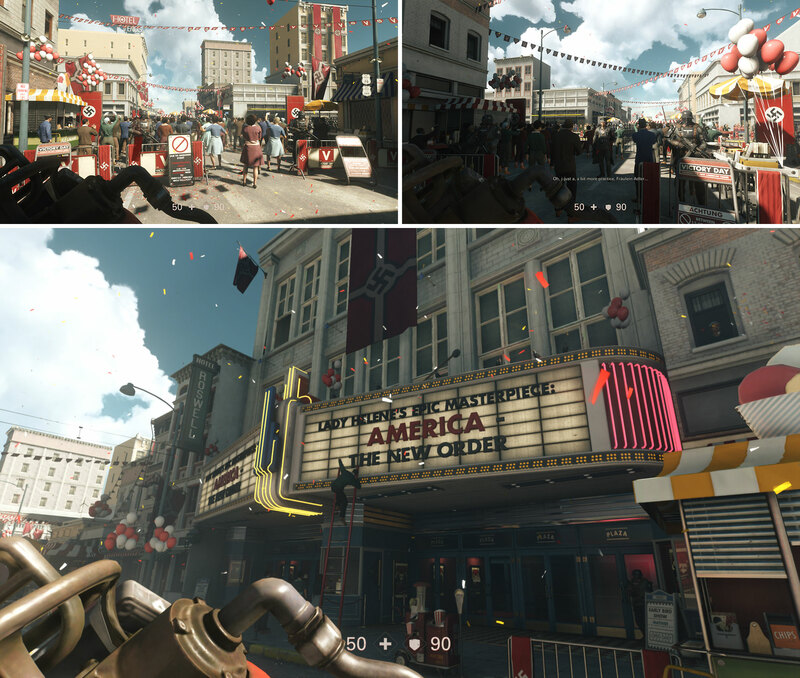 Thematically, this is a good primer for what to expect through the rest of your time with The New Colossus. The absurdity does not stop; in fact, there are set pieces in this game that make the U-boat seem banal. The problem, at least for me, is that those moments are sandwiched between some of the most frustrating shoot-outs I’ve ever played and some obtuse level design that would make mid-’90s Ravensoft blush. The core mechanics feel great. The movement, gunplay, and light platforming are all responsive. However, the cover mechanic is cumbersome at best. Theoretically, BJ either crouches behind or hugs the corner of a wall, and then when you aim down to iron sight, BJ should peek out. However, the player is usually left staring at a wall—or, worse, BJ contorts himself in inhuman ways that not only leave you still staring at a wall but also cause you to lose your sense of direction. This is no cover shooter, so that’s not a problem that you’ll encounter often, but that makes it that much more annoying when it does happen. The AI is very, very aggressive, and you always want to be moving and collecting health and armor pickups at any opportunity; if you plant yourself in cover for even a moment, you will be flanked and you will die. This is where my playthrough got frustrating. 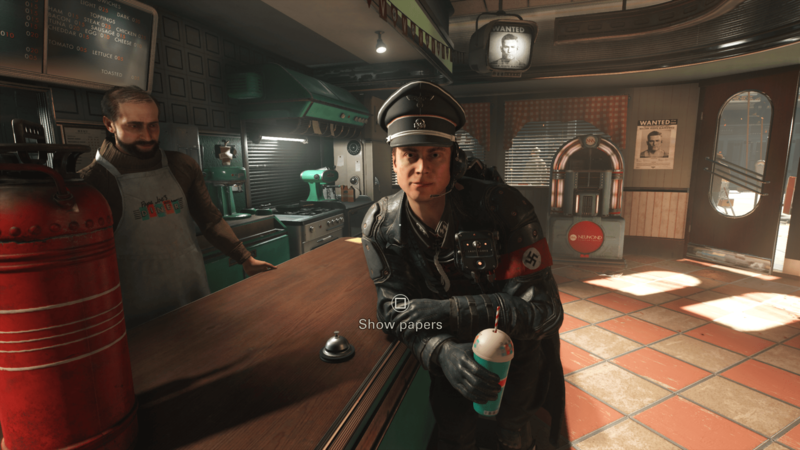 Wolfenstein II has an identity problem: at times, it wants to be a stealth game, but the AI is so sharp that playing it as such is frustrating. Once you get spotted (and you will get spotted), you’re dead. Your health drops from full to nothing before you even notice where the shots are coming from. The most effective way to defeat your Nazi opposition is to run away and maybe squeeze out some rounds when it’s convenient. Really. These sections became such a drag that I ran from checkpoint to checkpoint just to be done with it. Unfortunately for me, that strategy wasn’t always viable. At times you’re placed in a shoot-out where you need to kill all enemies to proceed—it’s just you, some health and armor pickups, and a whole lot of Nazis in a meat grinder. Never before have I had to drop a game’s difficulty all the way down in order to proceed. And I still had trouble with these sections. Without getting into spoilers, I’ll say that there’s a shoot-out in a courtroom, and it was the most frustrating set piece I’ve played in a game in a long, long time. Want to fire that mounted gun over there? Dead. Make a run for those health packs? Dead. Camp out in a seemingly unoccupied part of the room? Guess what—it’s a spawn point and you’re dead. Wolfenstein II is balanced horribly against the player, and that frustration made getting to the fun absurdities a drag. The bane of my existence. The game’s strongest hand is absolutely its presentation. 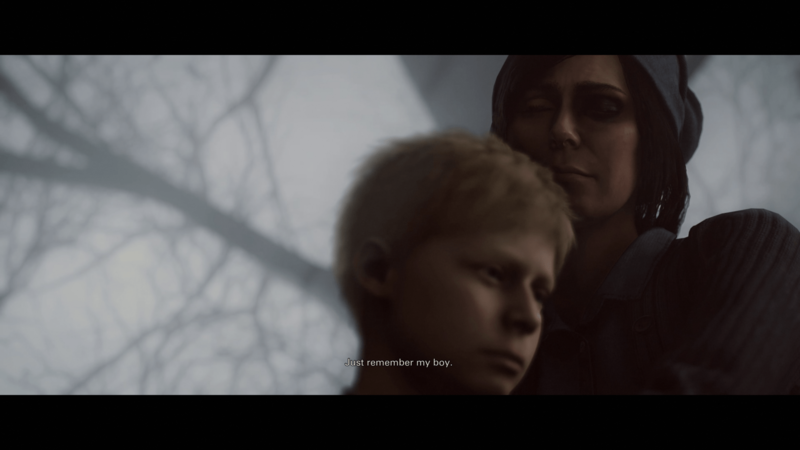 BJ’s haunting inner monologues are poetic; these musings of a man facing an inevitable death and leaving behind his significant other and their unborn twins are some of the most moving moments in any game that I’ve played. The supporting characters are all great, as well. The returning cast continues to be endearing, and the additions of Super Spesh and Grace further flesh out an already solid ensemble. 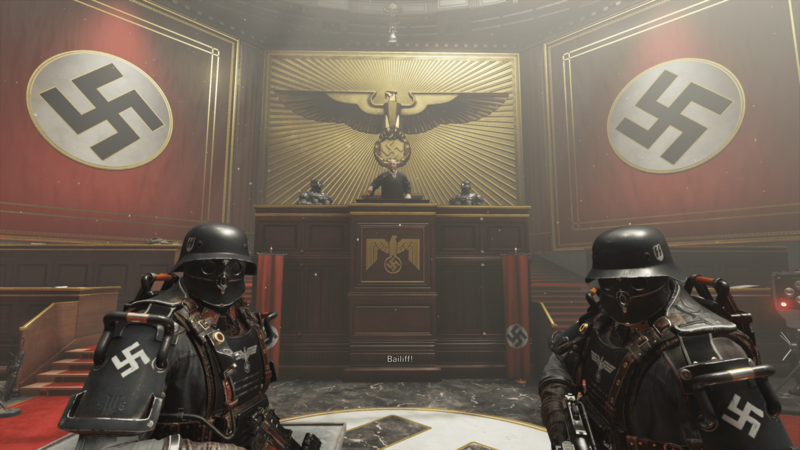 However, the Nazi-occupied city of Roswell, New Mexico, was the most memorable of all aspects in Wolfenstein II. Your trip to Roswell is unfortunately brief, but it leaves a lasting impact. This slow walk-and-talk moment was easily my favorite part of the game. You arrive in town dressed as a fireman and packing a nuclear warhead inside a faux fire extinguisher during a parade celebrating the Nazi occupation. I spent a ton of time here soaking in every detail I could: newspapers, signage, conversations, the scenery all of it was incredibly detailed. Hearing American citizens not only express complacency but even celebrate the Nazi occupation was genuinely unnerving. Roswell felt like the realization of the game was intended to be—like everything before and after that moment was just filler. 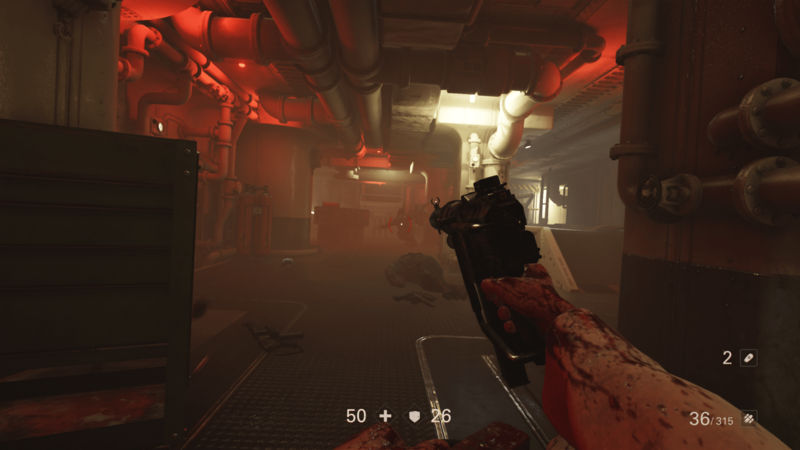 The level of detail in Roswell is unparalleled by any other aspect of Wolfenstein II. That moment was the game that I was hoping to play for hours, but it was just a flash in the pan because after that you’re back in another drab series of corridors getting shot dead. The level of detail on display in Roswell is awe inspiring. The peaks and valleys of Wolfenstein II were jarring, to say the least. I experienced some of the highest highs of any game I’ve played in years, but in the end that couldn’t balance out my frustration—a frustration that, when I was able, led me to actively not engage with the game’s core mechanic of shooting things. And there were some very high highs. Given the interesting things that happen in this game, it’s a shame that I had to drag myself across the finish line. In fact, if I hadn’t committed to this very review, I would have turned to YouTube and just watched the rest. As I previously stated, it took a long time for me to make peace with this. I loved The New Order and was fully expecting to love The New Colossus just as much, if not more. That thought was on my mind the entire time I played it through; I couldn’t comprehend the fact that I just wasn’t having a whole lot of fun. Perhaps the scales will be tipped a little more in the player’s favor through future patches, which would render a lot of what I have to say meaningless. But that’s not the game I played. Joe is a retired professional dishwasher currently residing in Duluth, Minnesota. To break the monotony of retirement, he turns to Twitter, where he complains about Batman v Superman and the DCEU as whole roughly once a week. Thereare video games there, too. Good to have a review like this to sink my teeth into before buying this game and being let down myself! Thanks Joe for your whimsical insights!